The 1982 FIFA World Cup was the 12th FIFA World Cup, played in Spain between 13 June and 11 July 1982. The tournament was won by Italy, who defeated West Germany 3–1 in the final match, held in the Spanish capital of Madrid. It was Italy's third World Cup win, but their first since 1938. The defending champions, Argentina, were eliminated in the second group round. Algeria, Cameroon, Honduras, Kuwait and New Zealand made their first appearances in the finals. The tournament featured the first penalty shoot-out in World Cup competition. This was the last World Cup to feature two round of group stages. It was also the third time (1934 and 1966) that all four semifinalists were European. In the first round of Group 3, Hungary defeated El Salvador 10–1, equalling the largest margin of victory recorded in the finals (Hungary over South Korea 9–0 in 1954, and Yugoslavia over Zaire 9–0 in 1974). Teams absent from the finals were 1974 and 1978 runners-up Netherlands (eliminated by Belgium and France), Mexico (eliminated by Honduras and El Salvador), and the three times 1970s participants Sweden (eliminated by Scotland and Northern Ireland). Northern Ireland qualified for the first time since 1958. Belgium, Czechoslovakia, El Salvador, England, and the Soviet Union were back in the Finals after a 12-year absence. England had its first successful World Cup qualifying campaign in 20 years – the English team had qualified automatically as hosts in 1966 and as defending champions in 1970, then had missed the 1974 and 1978 tournaments. Yugoslavia and Chile were also back after having missed the 1978 tournament. Algeria, Cameroon, Honduras, Kuwait, and New Zealand all participated in the World Cup for the first time. As of 2018, this was the last time that El Salvador and Kuwait qualified for a FIFA World Cup finals, as well as the last time that Mexico and South Korea failed to qualify. There was some consideration given as to whether England, Northern Ireland, and Scotland should withdraw from the tournament because of the Falklands War between Argentina and the United Kingdom. A directive issued by the British sports minister Neil Macfarlane in April, at the start of the conflict, suggested that there should be no contact between British representative teams and Argentina. This directive was not rescinded until August, following the end of hostilities. Macfarlane reported to Prime Minister Margaret Thatcher that some players and officials were uneasy about participating because of the casualties suffered by British forces. FIFA advised the British Government that there was no prospect that Argentina (the defending champions) would be asked to withdraw. It also became apparent that no other countries would withdraw from the tournament. It was decided[by whom?] to allow the British national teams to participate so that Argentina could not use their absence for propaganda purposes, reversing the intended effect of applying political pressure onto Argentina. A statue commemorating the 1982 FIFA World Cup at the Estadio Riazor in A Coruña. The first round was a round-robin group stage containing six groups of four teams each. Two points were awarded for a win and one for a draw, with goal difference used to separate teams equal on points. The top two teams in each group advanced. In the second round, the twelve remaining teams were split into four groups of three teams each, with the winner of each group progressing to the knockout semi-final stage. Group 2 saw one of the great World Cup upsets on the first day with the 2–1 victory of Algeria over reigning European Champions West Germany. In the final match in the group, West Germany met Austria in a match later dubbed as the Disgrace of Gijón. Algeria had already played their final group game the day before, and West Germany and Austria knew that a West German win by 1 or 2 goals would qualify them both, while a larger German victory would qualify Algeria over Austria, and a draw or an Austrian win would eliminate the Germans. After 10 minutes of all-out attack, West Germany scored through a goal by Horst Hrubesch. After the goal was scored, the two teams kicked the ball around aimlessly for the rest of the match. Chants of "Fuera, fuera" ("Out, out") were screamed by the Spanish crowd, while angry Algerian supporters waved banknotes at the players. This performance was widely deplored, even by the German and Austrian fans. One German fan was so upset by his team's display that he burned his German flag in disgust. Algeria protested to FIFA, who ruled that the result be allowed to stand; FIFA introduced a revised qualification system at subsequent World Cups in which the final two games in each group were played simultaneously. Group 4 opened with England midfielder Bryan Robson's goal against France after only 27 seconds of play. England won 3–1 and qualified along with France over Czechoslovakia and Kuwait, though the tiny Gulf emirate held Czechoslovakia to a 1–1 draw. In the game between Kuwait and France, with France leading 3–1, France midfielder Alain Giresse scored a goal vehemently contested by the Kuwait team, who had stopped play after hearing a piercing whistle from the stands, which they thought had come from Soviet referee Miroslav Stupar. Play had not yet resumed when Sheikh Fahad Al-Ahmed Al-Jaber Al-Sabah, brother of the then-Kuwaiti Emir and president of the Kuwait Football Association, rushed onto the pitch to remonstrate with the referee. Stupar reversed his initial decision and disallowed the goal to the fury of the French. Maxime Bossis scored another valid goal a few minutes later and France won 4–1. Brazil were in Group 6. With Zico, Sócrates, Falcão, Éder and others, they boasted an offensive firepower that promised a return to the glory days of 1970. They beat the USSR 2–1 thanks to a 20-metre Éder goal two minutes from time, then Scotland and New Zealand with four goals each. The Soviets took the group's other qualifying berth on goal difference at the expense of the Scots. The match between Brazil and Italy pitted Brazil's attack against Italy's defence, with the majority of the game played around the Italian area, and with the Italian midfielders and defenders returning the repeated set volleys of Brazilian shooters such as Zico, Sócrates and Falcão. Italian centre back Gentile was assigned to mark Brazilian striker Zico, earning a yellow card and a suspension for the semi-final. Paolo Rossi opened the scoring when he headed in Antonio Cabrini's cross with just five minutes played. Sócrates equalised for Brazil seven minutes later. In the twenty-fifth minute Rossi stepped past Júnior, intercepted a pass from Cerezo across the Brazilians' goal, and drilled the shot home. The Brazilians threw everything in search of another equaliser, while Italy defended bravely. On 68 minutes, Falcão collected a pass from Junior and as Cerezo's dummy run distracted three defenders, fired home from 20 yards out. Now Italy had gained the lead twice thanks to Rossi's goals, and Brazil had come back twice; At 2–2, Brazil would have been through on goal difference, but in the 74th minute, a poor clearance from an Italian corner kick went back to the Brazilian six-yard line where Rossi and Francesco Graziani were waiting. Both aimed at the same shot, Rossi connecting to get a hat trick and sending Italy into the lead for good. In the 86th minute Giancarlo Antognoni scored an apparent fourth goal for Italy, but it was wrongly disallowed for offside. In the dying moments Dino Zoff made a miraculous save to deny Oscar a goal, ensuring that Italy advanced to the semi-final. The match went to penalties, with France and West Germany participating in the first penalty shootout at a World Cup finals. Giresse, Manfred Kaltz, Manuel Amoros, Paul Breitner and Dominique Rocheteau all converted penalties until Uli Stielike was stopped by Ettori, giving France the advantage. But then Schumacher stepped forward, lifted the tearful Stielike from the ground, and saved Didier Six's shot. With Germany handed the lifeline they needed Littbarski converted his penalty, followed by Platini for France, and then Rummenigge for Germany as the tension mounted. France defender Maxime Bossis then had his kick parried by Schumacher who anticipated it, and Hrubesch stepped up to score and send Germany to the World Cup final yet again with a victory on penalties, 5–4. —Italian midfielder Marco Tardelli on his iconic goal celebration from the 1982 World Cup Final. In the third-place match, Poland edged the French side 3–2 which matched Poland's best performance at a World Cup previously achieved in 1974. France would go on to win the European Championship two years later. In the final, Antonio Cabrini fired a penalty wide of goal in the first half. In the second half, Paolo Rossi scored first for the third straight game by heading home Gentile's bouncing cross at close range. Exploiting the situation, Italy scored twice more on quick counter-strikes, all the while capitalising on their defence to hold the Germans. With Gentile and Gaetano Scirea holding the centre, the Italian strikers were free to counter-punch the weakened German defence. Marco Tardelli's shot from the edge of the area beat Schumacher first, and Alessandro Altobelli, the substitute for injured striker Francesco Graziani, made it 3–0 at the end of a solo sprint down the right side by the stand-out winger Bruno Conti. Italy's lead appeared secure, encouraging Italian president Sandro Pertini to wag his finger at the cameras in a playful "not going to catch us now" gesture. In the 83rd minute, Paul Breitner scored for West Germany, but it was only a consolation goal as Italy won 3–1 to claim their first World Cup title in 44 years, and their third in total. Italy became the first team to advance from the first round without winning a game, drawing all three (while Cameroon were eliminated in the same way by virtue of having only one goal scored against Italy's two), and also the only World Cup winner to draw or lose three matches at the Finals. By winning, Italy equalled Brazil's record of winning the World Cup three times. Italy's total of twelve goals scored in seven matches set a new low for average goals scored per game by a World Cup winning side (subsequently exceeded by Spain in 2010), while Italy's aggregate goal difference of +6 for the tournament remains a record low for a champion, equalled by Spain. Italy's 40-year-old captain-goalkeeper Dino Zoff became the oldest player to win the World Cup. This was the first World Cup in which teams from all six continental confederations participated in the finals, something that did not happen again until 2006. 17 stadiums in 14 cities hosted the tournament, a record that stood until the 2002 tournament, which was played 20 stadiums in two countries. The most used venue was FC Barcelona's Camp Nou stadium, which hosted five matches, including a semi-final; it was the largest stadium used for this tournament. 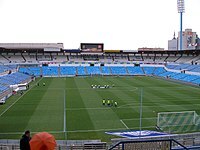 With Sarrià Stadium also hosting three matches, Barcelona was the Spanish city with the most matches in España 1982 with eight; Madrid, the nation's capital, followed with seven. This particular World Cup was organised in such a way that all of the matches of each of the six groups were assigned stadiums in cities near to each other, in order to reduce the stress of travel on the players and fans. For example, Group 1 matches were played in Vigo and A Coruña, Group 2 in Gijón and Oviedo, Group 3 in Elche and Alicante (except for the first match, which was the opening match of the tournament, which was played at the Camp Nou), Group 4 in Bilbao and Valladolid, Group 5 (which included hosts Spain) in Valencia and Zaragoza, and Group 6 in Seville and Malaga (of the three first-round matches in Seville, the first match between Brazil and the Soviet Union was played in the Pizjuán Stadium, and the other two were played in the Villamarín Stadium). 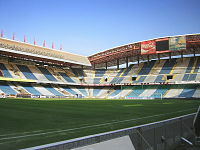 The two semi final matches were held at Camp Nou and the Pizjuán Stadium in Seville, the third largest stadium used for the tournament (one of only two España 1982 matches it hosted), the third place match was held in Alicante and the final was held at the Bernabeu, the second largest stadium used for this tournament. The 24 qualifiers were divided into four groupings which formed the basis of the draw for the group stage. FIFA announced the six seeded teams on the day of the draw and allocated them in advance to the six groups; as had become standard, the host nation and the reigning champions were among the seeds. The seeded teams would play all their group matches at the same venue (with the exception of World Cup holders Argentina who would play in the opening game scheduled for the Camp Nou, the largest of the venues). The remaining 18 teams were split into three pots based on FIFA's assessment of the team's strength, but also taking in account geographic considerations. The seedings and group venues for those teams were tentatively agreed at an informal meeting in December 1981 but not officially confirmed until the day of the draw. FIFA executive Hermann Neuberger told the press that the seeding of England had been challenged by other nations but they were to be seeded as "the Spanish want England to play in Bilbao for security reasons". On 16 January 1982 the draw was conducted at the Palacio de Congresos in Madrid, where the teams were drawn out from the three pots to be placed with the seeded teams in their predetermined groups. Firstly a draw was made to decide the order in which the three drums containing pots A, B and C would be emptied. The teams were then drawn one-by-one and entered in the groups in that order. A number was then drawn to determine the team's "position" in the group and hence the fixtures. The only stipulation of the draw was that no group could feature two South American teams. As a result, Pot B – which contained two South American teams – was initially drawn containing only the four Europeans, which were then to be immediately allocated to Groups 3 and 6 which contained the two South American seeds Argentina and Brazil. Once these two groups had been filled with the entrants from Pot B, then Chile and Peru would be added to the pot and the draw continue as normal. In the event, FIFA executives Sepp Blatter and Hermann Neuberger conducting the draw initially forgot this stipulation and immediately placed the first team drawn from this pot (Belgium) into Group 1, rather than Group 3 before then placing the second team drawn out (Scotland) into Group 3; they then had to correct this by moving Belgium to Group 3 and Scotland into Group 6. The ceremony suffered further embarrassment when one of the revolving drums containing the teams broke down. The group winners and runners-up advanced to the second round. The second round of matches consisted of four 3-way round-robin groups, each confined to one stadium in one of Spain's two largest cities: 2 in Madrid, and 2 in Barcelona. The winners of each one of these groups would progress to the semi-finals. Although the fixtures were provisionally determined in advance, the teams competing in each fixture depended on the result of the opening match in each group: Should a team be defeated in the opening game of the group, that team would then have to play in the second fixture against the team not participating in the opening group game; the winner of the opening game would, by contrast, be rewarded by not needing to play again until the final fixture of the group and therefore gained extra recovery time. If the opening game was a draw, the predetermined order of games would proceed as planned. These regulations helped ensure that the final group games were of importance as no team could already have progressed to the semi-finals by the end of the second fixtures. 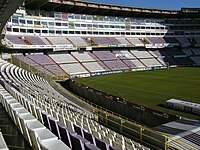 The 43,000-capacity Sarria Stadium in Barcelona, used for the Group C round-robin matches between Italy, Argentina and Brazil was, unlike any of the other matches (except 1) in the other groups, severely overcrowded for all 3 matches. 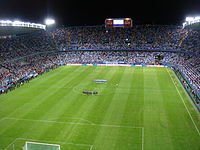 The venue was then heavily criticised for its lack of space and inability to handle such rampant crowds; although no one had foreseen such crowds at all; the Group A matches held at the nearby and much larger 99,500-capacity Camp Nou stadium never went past 65,000 and hosted all European teams; it was anticipated there would be larger crowds for the Camp Nou-hosted second round matches between Belgium, the Soviet Union and Poland. Paolo Rossi received the Golden Boot for scoring six goals. In total, 146 goals were scored by 100 players, with only one of them credited as own goal. The official poster was designed by Joan Miró. Football in Action (fútbol en acción) was the name of an educational animated series first aired in 1982 on public broadcaster RTVE. Chapters had a duration of 20 minutes and the main character was Naranjito. The series lasted for 26 episodes and the theme was football, adventures and World Cup of 82. Naranjito was accompanied by other characters, as his girlfriend Clementina, his friend Citronio and Imarchi the robot. ^ a b c "1982 FIFA World Cup Spain - Awards". FIFA.com. Fédération Internationale de Football Association. Retrieved 3 February 2019. ^ Lewis, Tim (11 July 2014). "1982: Why Brazil V Italy Was One Of Football's Greatest Ever Matches". Esquire. Archived from the original on 27 September 2015. Retrieved 20 May 2015. ^ Ger, McCarthy (10 July 2011). "Memory Lane – West Germany v France at World Cup 82". Backpage Football. Retrieved 17 June 2014. ^ a b c d e f g h "World Cup withdrawal considered amid Falklands War". BBC Sport. BBC. 28 December 2012. Retrieved 28 December 2012. ^ "1982 FIFA World Cup Outline". Soccernostalgia. 31 May 2015. Retrieved 16 June 2015. ^ "Italy qualify with two goals in three games". Glasgow Herald (page 19). 24 June 1982. Retrieved 16 June 2015. ^ Booth, Lawrence; Smyth, Rob (11 August 2004). "What's the dodgiest game in football history?". guardian.co.uk. Guardian News and Media. Archived from the original on 6 October 2011. Retrieved 25 February 2009. ^ "Ten-man Irish in fairytale victory". Glasgow Herald (page 19). 26 June 1982. Retrieved 16 June 2015. ^ "1982: Why Brazil V Italy Was One Of Football's Greatest Ever Matches". Esquire.co.uk. 30 May 2014. Archived from the original on 27 September 2015. Retrieved 1 July 2014. ^ Foot, John (24 August 2007). Winning at All Costs: A Scandalous History of Italian Soccer. p. 470. ISBN 9781568586526. Retrieved 1 July 2014. ^ Stadium capacities, Panini official album to World Cup 1982. ^ Alsos, Jan. "Planet World Cup – 1982 – Match Schedule". www.planetworldcup.com. ^ a b "The FIFA World Cup Final Draw history" (PDF). FIFA. 2009. ^ "England world seeds – official". Glasgow Herald. 12 December 1981. ^ a b "1982 FIFA World Cup in Spain; Report of FIFA" (PDF). FIFA. 1982. ^ a b "World Cup: Confusion and chaos at the 1982 draw". BBC Sport. 15 July 2009. ^ "Stein gets down to business". Glasgow Herald. 18 January 1982. ^ a b c "Der Spielplan für die WM '82". Kicker – Sonderheft WM '82 (in German). May 1982. p. 3. ^ "82: The original and harshest Group of Death". www.fourfourtwo.com. 2 June 2014. ^ "Russia's 2018 World Cup poster is super retro". 30 November 2017.